The cerebral yet atmospheric adventures of Sherlock Holmes made for perfect radio listening on a chill winter night -- especially when Basil Rathbone took the role of the famous consulting detective, with Nigel Bruce at his side as Doctor Watson. 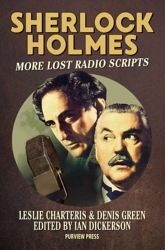 Many broadcasts from this series have been forever lost -- and many of the scripts for the 1944-45 radio season were thought to have met the same fate. But now, fifteen of these previously lost stories (written by Denis Green and Leslie Charteris) are collected here! Twelve scripts are presented in their entirety, along with three nearly complete scripts (which pose slight mysteries of their own). Huddle up to the fireside and read on - the game's afoot! 396 pages.